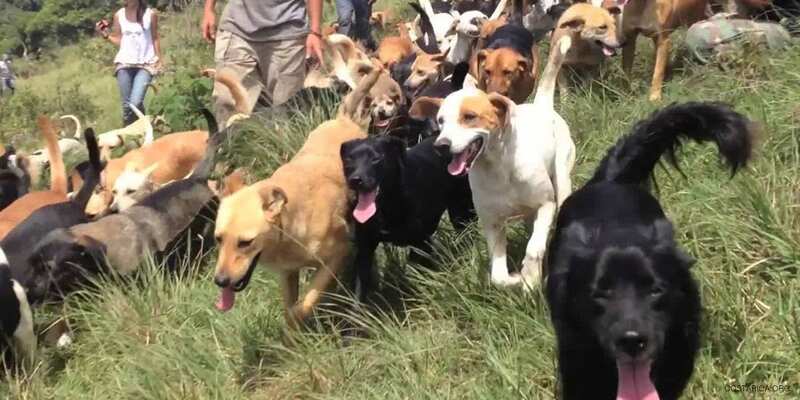 Territorio de Zaguates, land of Stray Dogs in English, is the most famous and most celebrated Costa Rica dog sanctuary. The sanctuary is located in Heredia, directly north of San Jose. There are more than 1000 stray dogs running freely across the grounds. Mutts and abandoned dogs alike are given a second chance. As a non-profit organization, the shelter only uses money for the improvement of the organization and the animals. Fundraisers are often organized and people can offer money but can also simply bring dog food on their visit. First things first! When a dog arrives at the shelter they are neutered and vaccinated to ensure the health and longevity of the animals. Many of the dogs have come from the streets or abusive households. The facilities aren’t glamorous or fit for a king but are more than suited for a fluffy friend. The housing has soft beds, a feeding area, and washing stations. Sometimes a dog might have special needs and is put into quarantine if necessary. The shelter is strictly non-profit and no-kill. This also means it can get very expensive to keep running. The dogs don’t feed themselves and they do need shots and surgeries to keep healthy. You can support the shelter by visiting during their large walk or making donations. These usually come in the form of dog food or money. Getting to the doggy destination is not hard. It is approx. 30 minutes from San Jose and even closer to the San Jose airport, should you want to go directly there from your flight. When should you Visit the Territorio de Zaguates? Visitors are welcome but visiting hours are a little erratic and you can’t trust what it says on the google profile. Instead it is best to call and find out the best possible time to come and visit. They sometimes reschedule events depending on conditions. Walks take place usually two to three times a month on weekends though you never know unless you confirm. If you show up unexpected you may find the gates are closed. Territorio de Zaguates is currently closed to the public. They are undergoing some structural changes as well as protecting the dogs against those who saw fit to break in and poison some of them. But keep updated and follow the amazing Territorio de Zaguates on Social Media! The best things you can give a dog, is love and freedom. Territorio de Zaguates built its message on love and the desire to rescue animals rejected by society. The shelter also hopes to offer the animals freedom by giving them a chance to roan the lands freely, play and explore by the hundreds or even thousands. This shelter is an important step towards better animal rights in Costa Rica. Costa Rica has struggled for a year to obtain a decent infrastructure to support the rights people wanted to give to wildlife as well as pets. This has proven hard mainly because Costa Rica was enforcing a lot of laws without teeth. The desire for protecting animals was there, but the justice system could not effectively punish those who would harm the animals. All of this culminated in the 2017 Animal Welfare Bill. Causing harm to animals (excluding the animals used in agriculture, science and local traditions) is now considered a criminal act. If this bill will prove more efficient and will soon expand to other kinds of animals, remains to be seen. Time will tell. But the fact that 2019 marks the year that 8 people are put on trial for animal abuse, is very promising indeed.